Landmarks considers proposed rooftop addition and renovations to four rowhouses at 21 – 27 Ninth Ave. in Manhattan. Photo: CityLand. Community board and preservation groups supported rowhouses’ facade alterations but not the proposed rooftop addition. 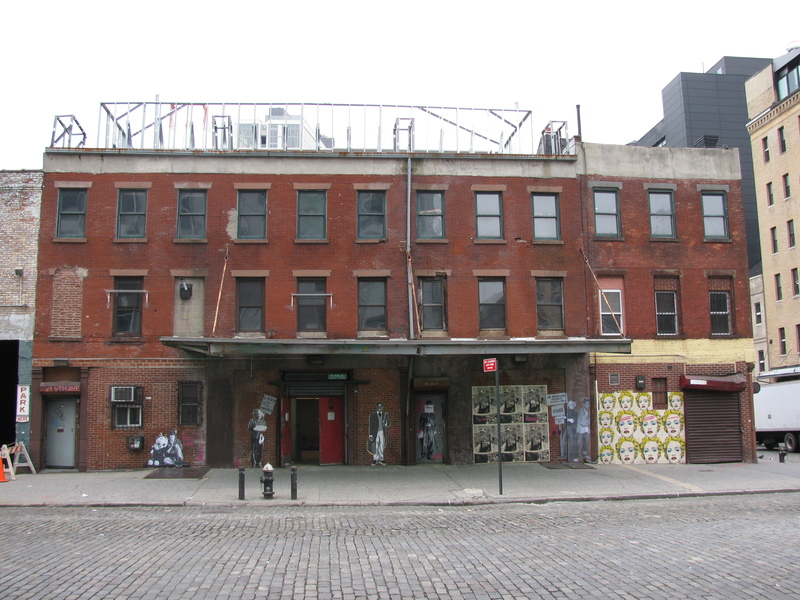 On November 10, 2009, Landmarks heard testimony on Aurora Capital Associates’ redevelopment proposal for four, three-story Greek Revival rowhouses at 21 through 27 Ninth Avenue in the Gansevoort Market Historic District. The proposal included restoring the 19th century buildings’ red-brick facade, replacing ground floor infill with steel and glass storefronts, replacing and extending a metal marquee, and converting the ground floor to retail use. Aurora would build an eleven-and- a-half foot tall steel and glass rooftop addition, set back fifteen feet, and spanning the three mid-block rowhouses at 21, 23, and 25 Ninth Avenue. BKSK architect Harry Kendall testified that the inspiration for the rooftop addition came from the ironwork of the nearby elevated railroad tracks, and from viewing tax photos taken in the 1870s showing the rowhouses with chimneys, long since demolished. Kendall explained that recessed metal panels would divide the addition, reflecting the tripartite division of the buildings. He described the addition as “shipping container-ish” and said it would reflect the district’s industrial character. Kendall said the glass and steel addition’s transparency would reflect the “visible life” of the High Line. A representative of Manhattan Community Board 2 spoke in favor of the facade alterations but opposed the rooftop addition. Elizabeth Solomon, representing the Greenwich Village Society for Historic Preservation, testified that the addition would radically alter the character of the buildings, which she noted were some of the oldest in the historic district. Landmarks Commissioners generally responded positively, but did not vote on the proposal. Commissioner Fred Bland said he was “completely persuaded” by the presentation and that the proposal fit the historic district’s context. Vice Chair Pablo Vengoechea said he appreciated the mix of contemporary architecture blended with the preservation of the buildings’ historic fabric, but suggested reducing the height of the rooftop addition by at least one foot so as not to overwhelm the scale of the facade. Commissioners Diana Chapin and Libby Ryan agreed with this assessment, and Ryan recommended that the addition include more steel and less glass. Chair Robert B. Tierney agreed that the addition’s scale should be reduced, and he closed the hearing so that the applicant could return with a revised proposal. LPC: 21-27 Ninth Avenue, Manhattan (10-1847) (Nov. 10, 2009).